I just started running this market. It happens on the second Sunday of the month. It combines two passions, rooting through old stuff and rooting through music. It is based in an industrial unit which is home to the The Green Door Farmers Market, open daily Tuesday to Sunday with its busiest day being Saturday. It selling fresh and organic hot and cold food straight from the farm. On the second Sunday of the month we take over the space and bring in stall holders selling allsorts from antiques to bric a brac, vintage clothes, vinyl, jewellry and lots of healthy tasty food. We also feature live music from 11.30am. And its different, so please give it go. Your support will make it happen. 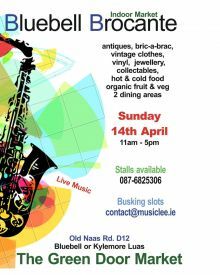 So far we have had Frankie Lane and Paul kelly, Albert Niland, Liam Merriman, Martin McDonnell, Ben Prevo, Adam and Siobhan... details for 14th April to be confirmed but you won't be dissapointed. Plenty of free parking, toilets, dining areas, animal friendly, fully wheelchair accessible.